POMPEII at the ROM | Kids in T.O. There once was a small, small window when I could visit museums with my kids in TOw. You know — actually browse the galleries and contemplate art. Well, that peaceful period (when stroller naps were perfectly timed) is long gone. Now I’m bringing ping pong balls — two boys who bounce from one object to the next, skipping over displays, then racing to the next gallery before I get a chance to even read a label. So I couldn’t be happier that museums and galleries have started incorporating kid-friendly elements to exhibitions that are not necessarily for a young audience. The latest, POMPEII: In the Shadow of the Volcano is among them, on display at the ROM until January 3, 2016. Your kids have probably seen the ads – a huge volcano erupting. It’s a fascinating story for young and old – Mount Vesuvius erupts 2,000 years ago with such force that the ash and debris buries the entire Roman city of Pompeii within 24 hours. Lucky for us, some of what was discovered only in the last few centuries – 200 artifacts in fact – are on display here in Toronto. Kids love archaeology and its a nice change of pace to step away from dinosaur bones and explore the people and lives from an ancient city. When Pompeii was finally excavated, the whole city was nearly intact. It’s like a time capsule. 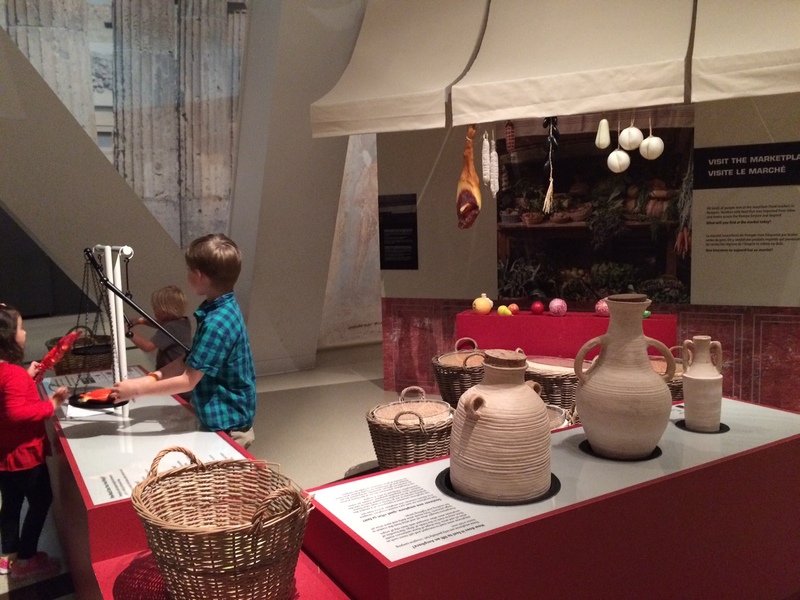 Dress up: Once you turn the first corner of the exhibition, you’ll begin to explore Roman life. Kids and adults in TOw can learn how to dress in togas. Little or big gladiators can see how they measure up behind some real armour and learn about the combat techniques and weaponry. Play: Half-way through the exhibition you’ll come across a market where kids can spend time filling baskets and weighing food on scales typical of that period. Videos: My eldest is obsessed with natural disasters, but even those who are not, the two video recreations will have you and your kids in TOw stopped in your tracks. It’s not meant to be scary but the exhibition area is dimmed, the video large and volume quite loud. The most interesting is the timeline that explains how the citizens of Pompeii did not have time to escape. Here it was nice to talk about how much has changed. With todays technology we’re much more likely to have advanced warning of such natural disasters. 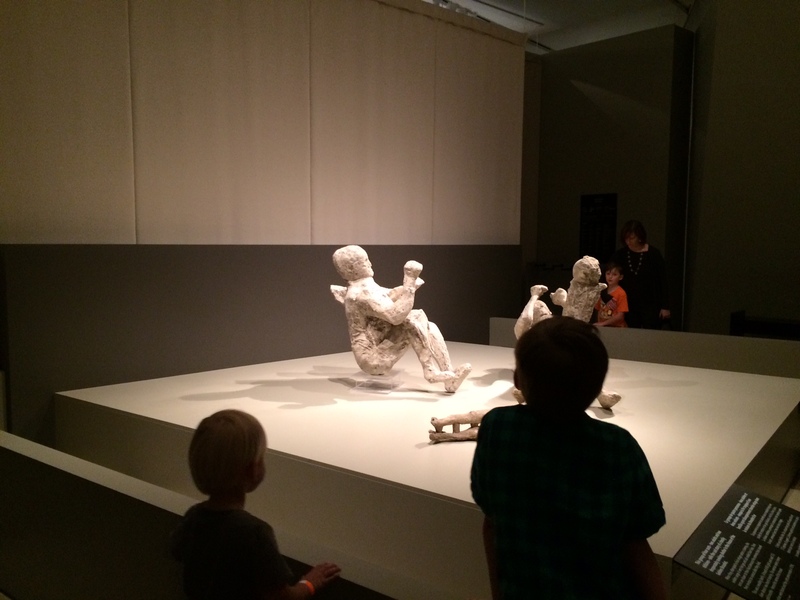 Visual: The plaster body casts of those who perished are probably the most compelling aspect of the exhibition. Using 3-D technology, the casts of adults, kids and dogs were reconstructed from cavities left in the hardened ash. Their bodies decayed, leaving behind a perfect imprint and filled by pouring plaster into these hollow spaces. A great illustration of this process is at the end of the exhibition in the room full of these casts. Visitors get their first look at the exhibition’s start with a cast of a dog, but the room at the end is quite a lot to take in for kids and adults alike. Take some time to talk about who these people were and what they were likely doing when disaster struck. This weekend is a ROM Big Weekend that has kid-friendly activities based on archeology. Among them, Roman re-enactors doing some military drills. 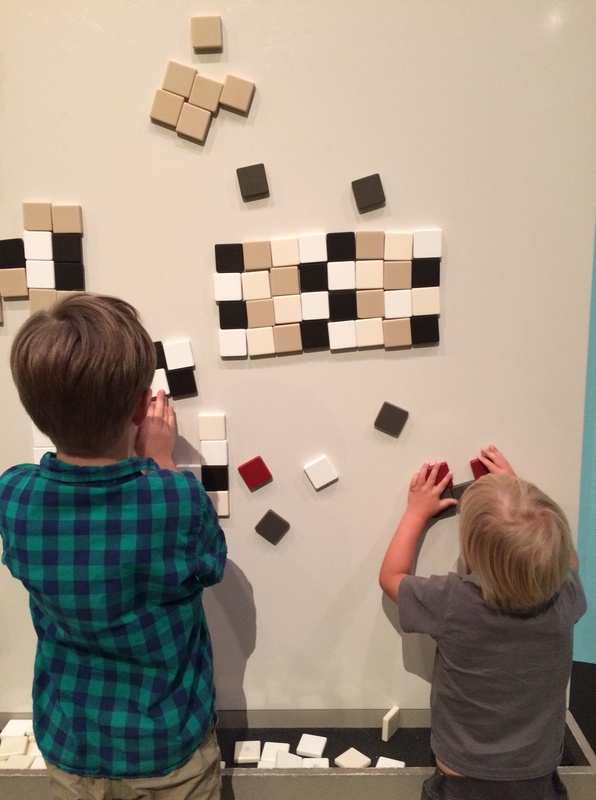 Keep an eye on the ROM’s website for info on upcoming family-focused programming. Getting there and other trip tips are here. Current hours and admission prices. You can join the conversation with #ROMPEII.